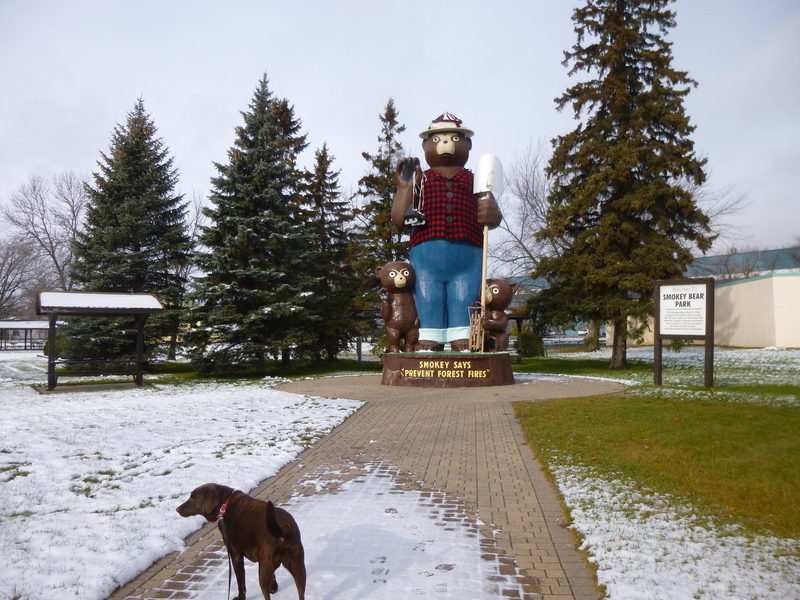 Before heading out into some more remote parts of Minnesota, I went out for another 2 1/2 mile walk around International Falls. 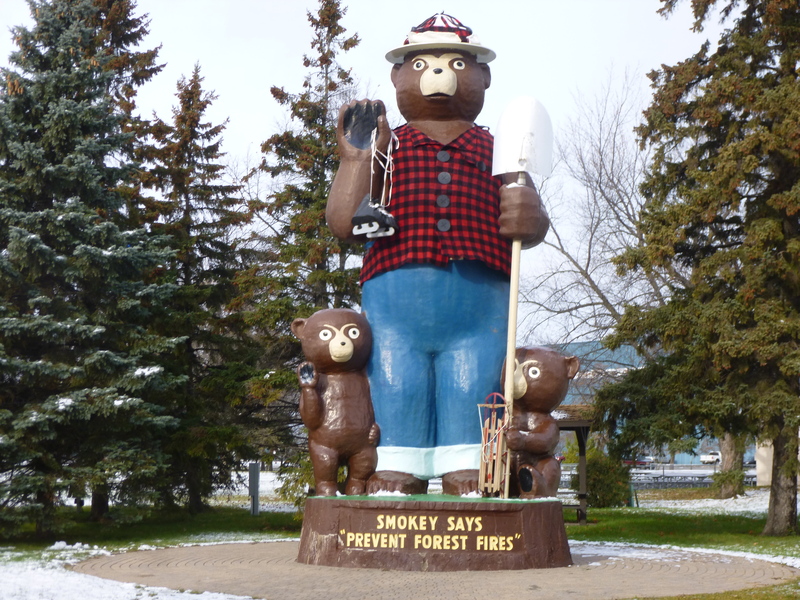 We stopped by Smokey Bear park to admire yet another large 26 foot tall statue! Tula walked part of the way with me but it was kind of slippery so I put her back in the van. Even though I was paying careful attention to where I walked, I still slipped on an icy part of the sidewalk and fell. No harm done though, other than a scraped knee, but it was time to end that walk! 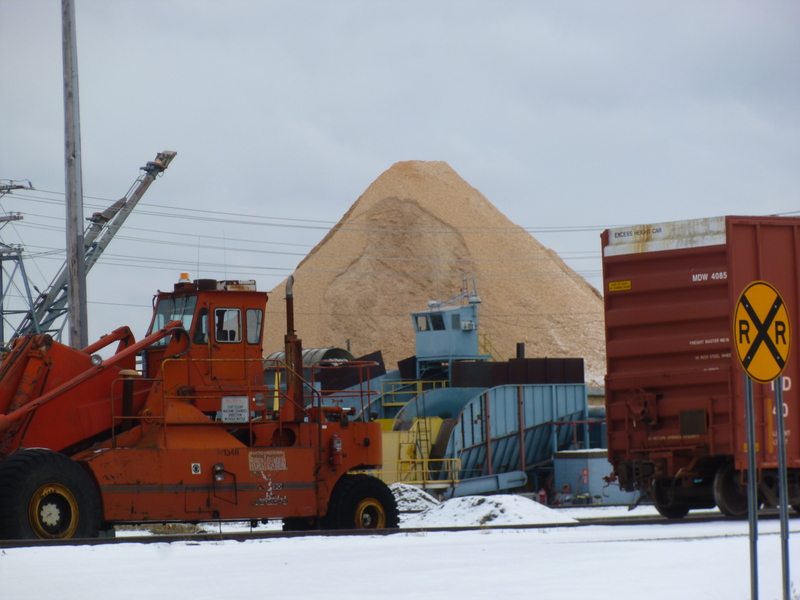 As I left International Falls, I passed the rail yard where there were mountains of sawdust and woodchips. 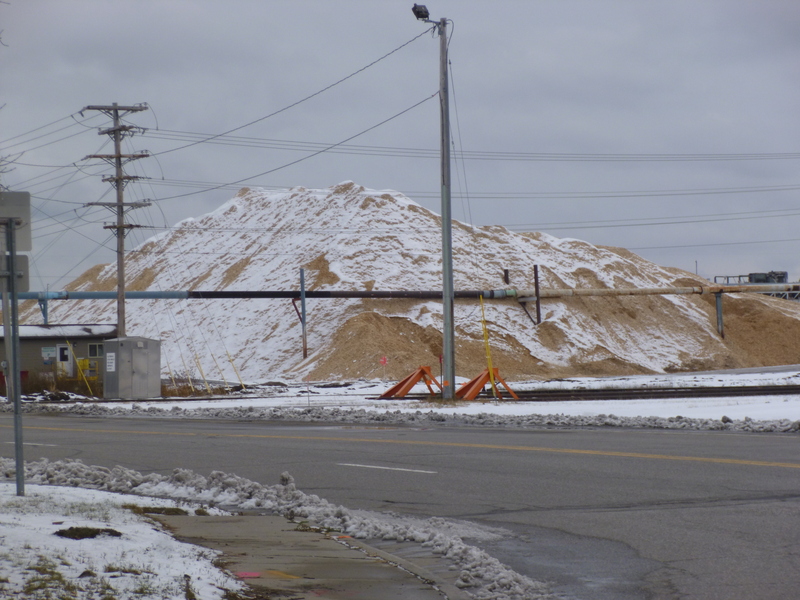 Lots of wood comes into this town since it’s the home of the Boise Cascade Paper Mill. 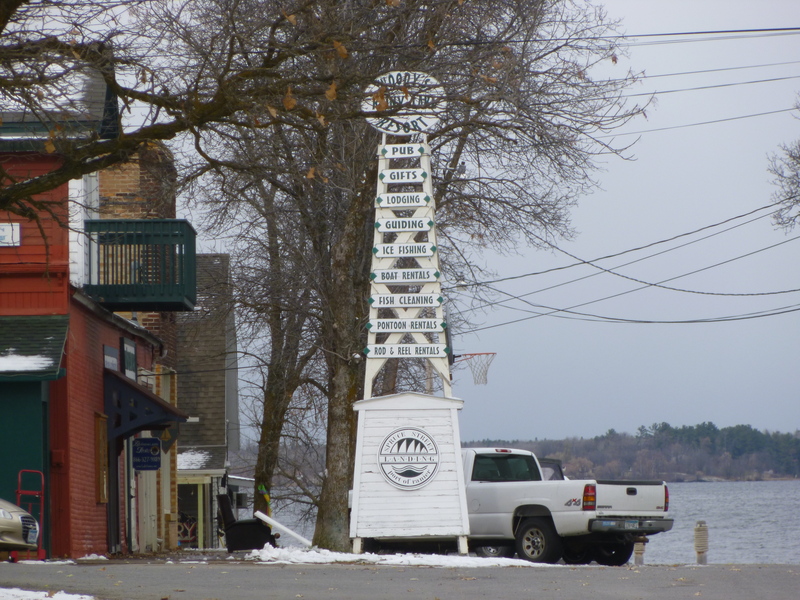 I decided to take a relatively short drive out to the end of the road, through the little villages of Ranier and Island View. 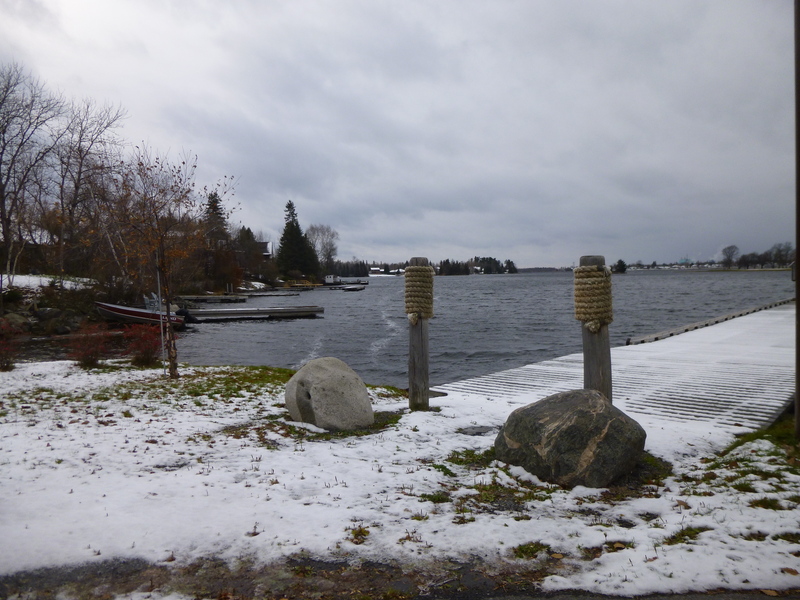 The road ended at the western entrance to Voyageurs National Park, which I look forward to visiting sometime when the boat tours are running. 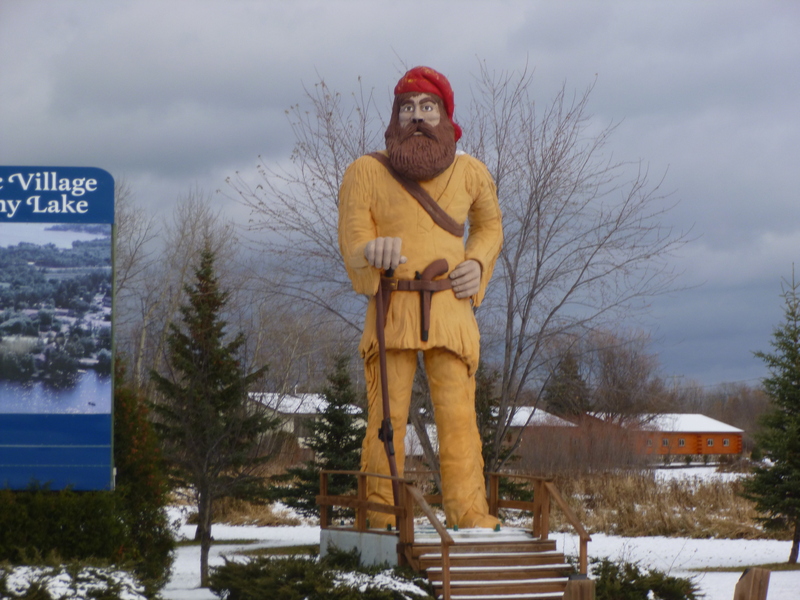 The town of Ranier had another statue – this one was a 30 foot tall statue of Big Vic, a French-Canadian fur trapper which is also known as a voyageur. 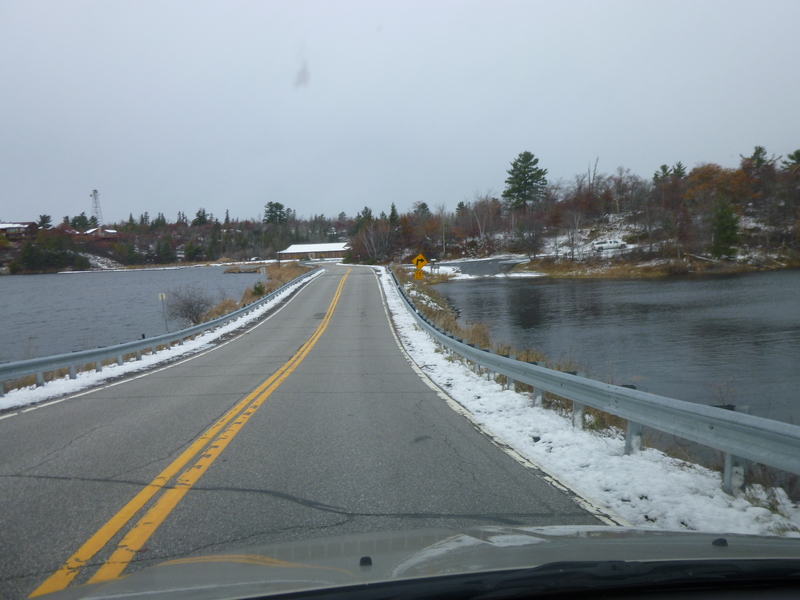 The drive out to Island View was gorgeous, even in snow. 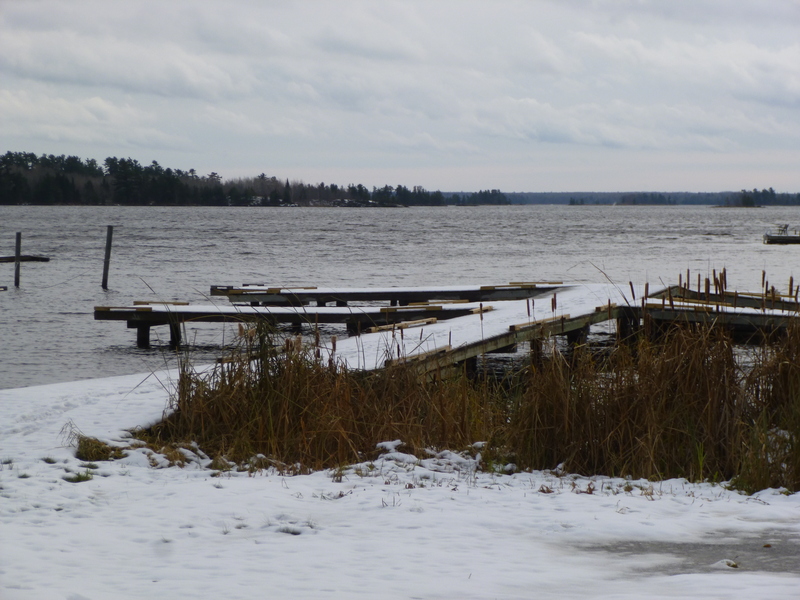 I drove along part of the shore of Rainy Lake – another giant lake that forms part of the border between Minnesota and Canada. 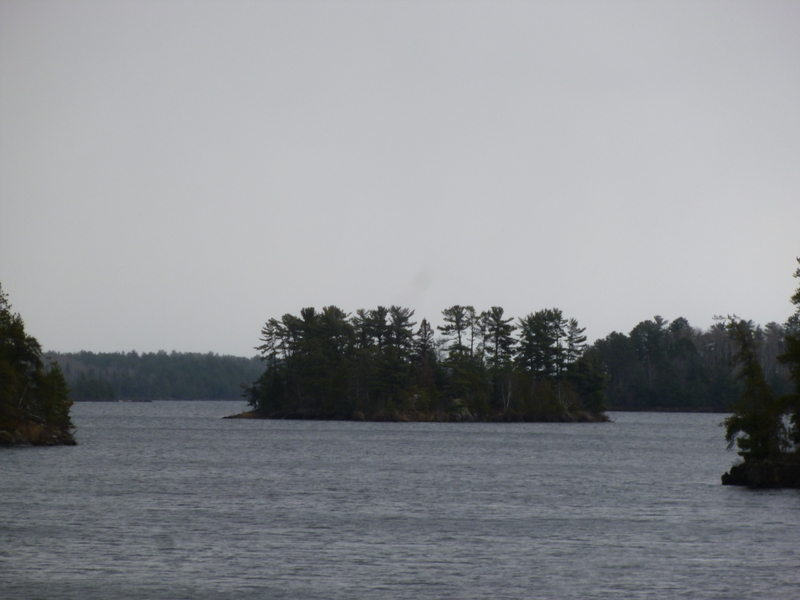 There were little islands in the water; some with just a couple trees on them, and it was wonderfully scenic – just like I had imagined this part of the state. 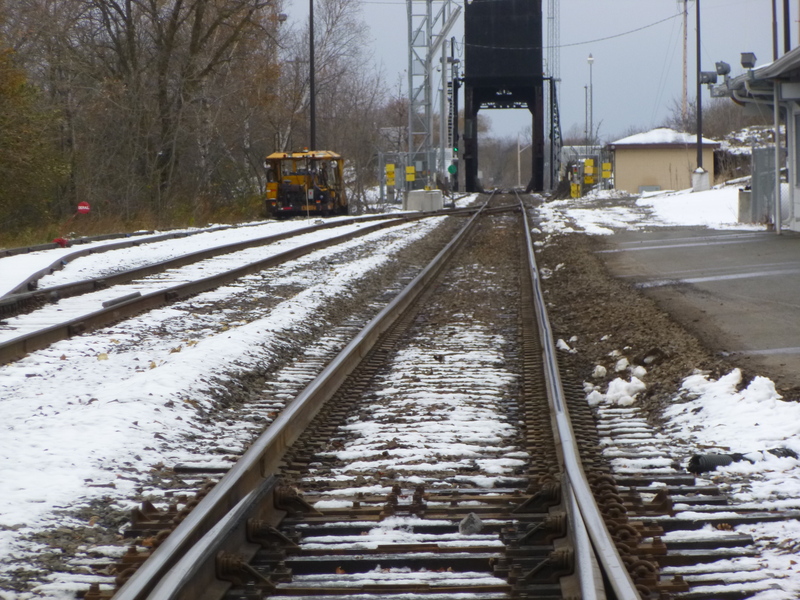 Then I continued driving southeast. 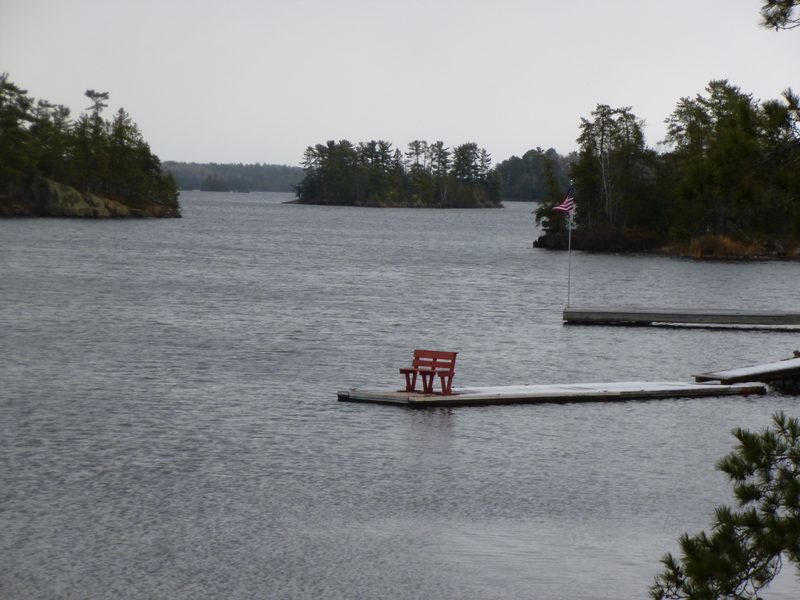 This whole part of the state is either state forest land, national forest land or Boundary Water Canoe Area Wilderness. 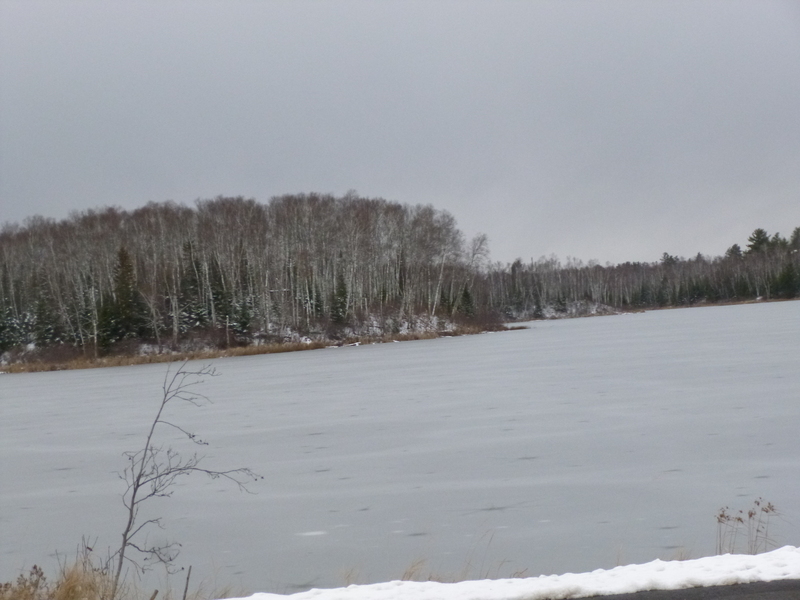 It’s wild and beautiful and I was headed for the town of Ely. 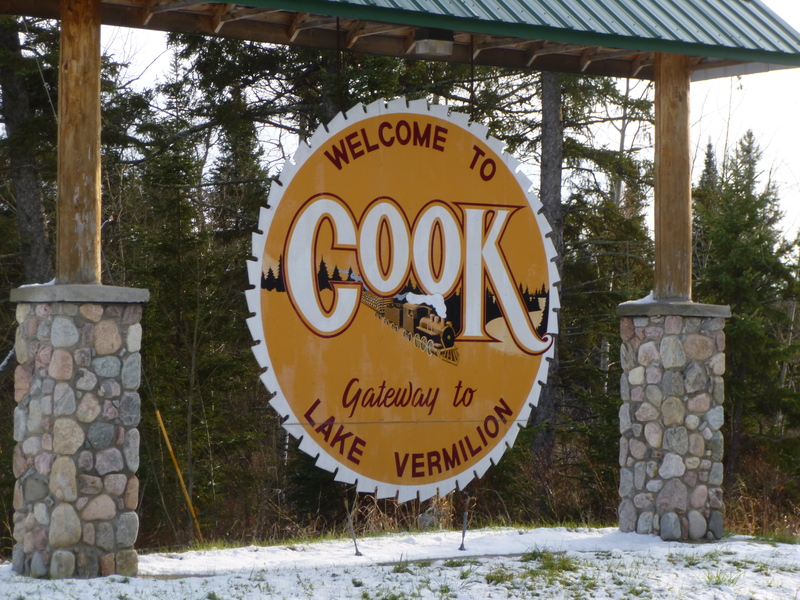 Along the way I stopped in Cook and Tula and I walked a little over a mile. 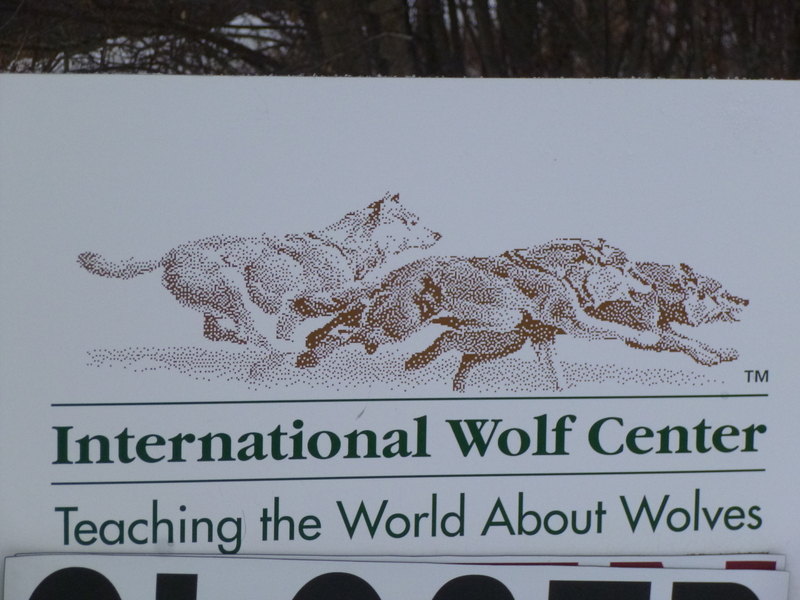 We continued on to Ely, where I had read about the International Wolf Center. 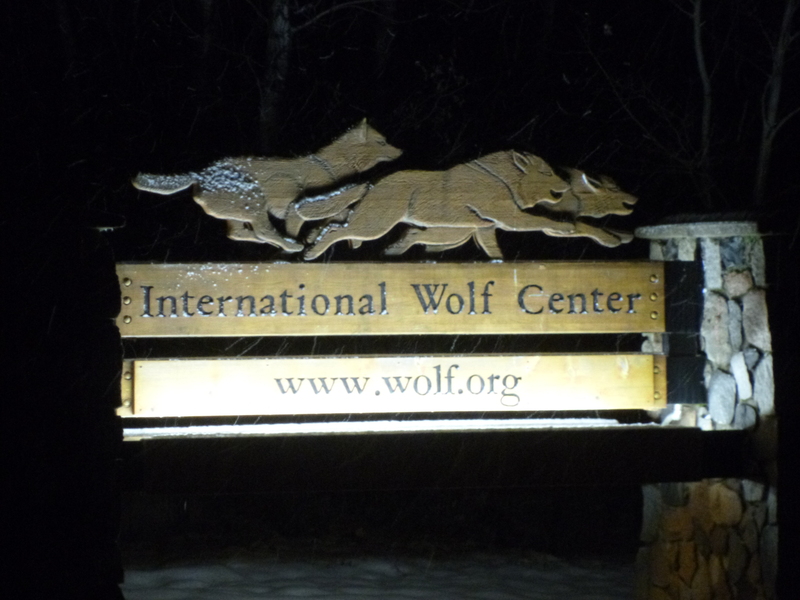 The wolf center allows visitors to see wolves in their northwoods habitat, and it is also an educational facility. 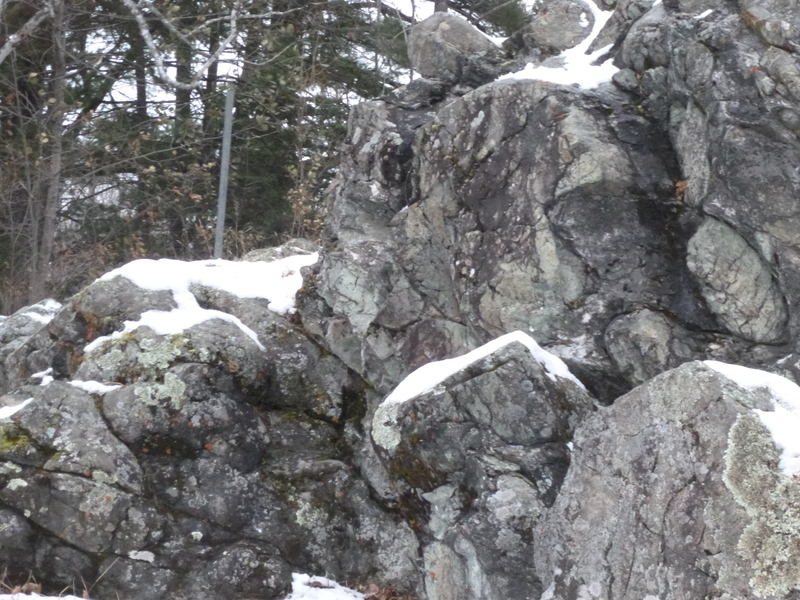 At different times of the year they offer programs like treks into the forest to howl at wolves, and dog-sledding trips. 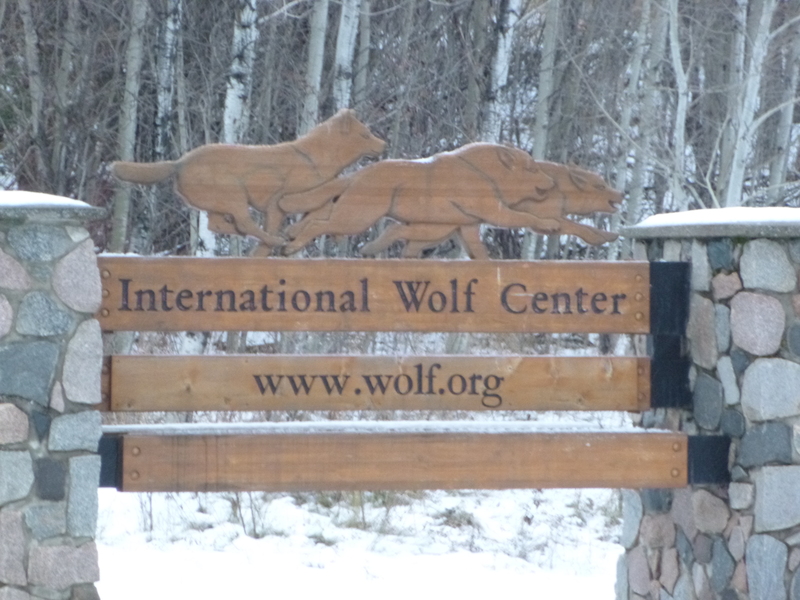 Their visiting hours are limited this time of year and the information I had indicated the Wolf Center wasn’t open on Sundays. 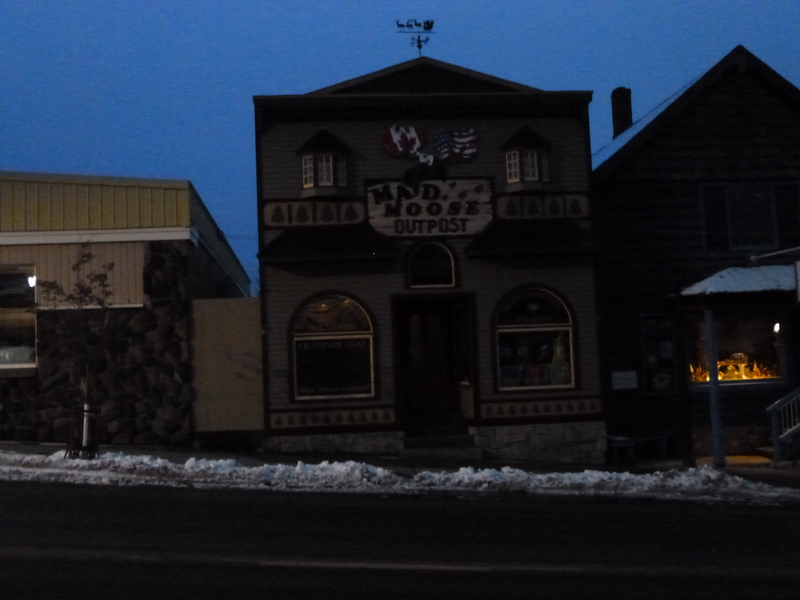 But I drove there anyway, and discovered they were open for a few hours on Sundays, although I had missed it. 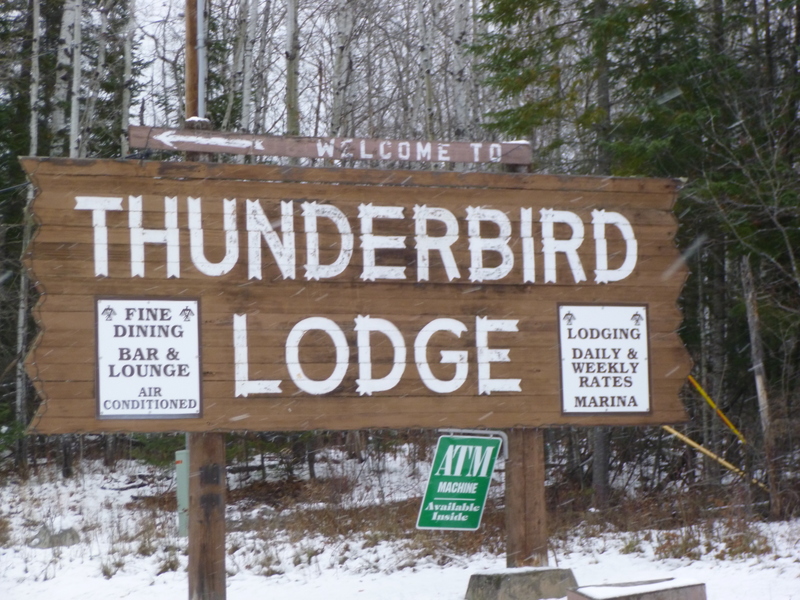 That was a bit disappointing, but I wanted to make a donation there anyway, because it just seemed like such an appropriate thing to do in this northwoods part of the state. The relationship between wolf life and human life is complicated, and education helps, so I mailed in a donation. 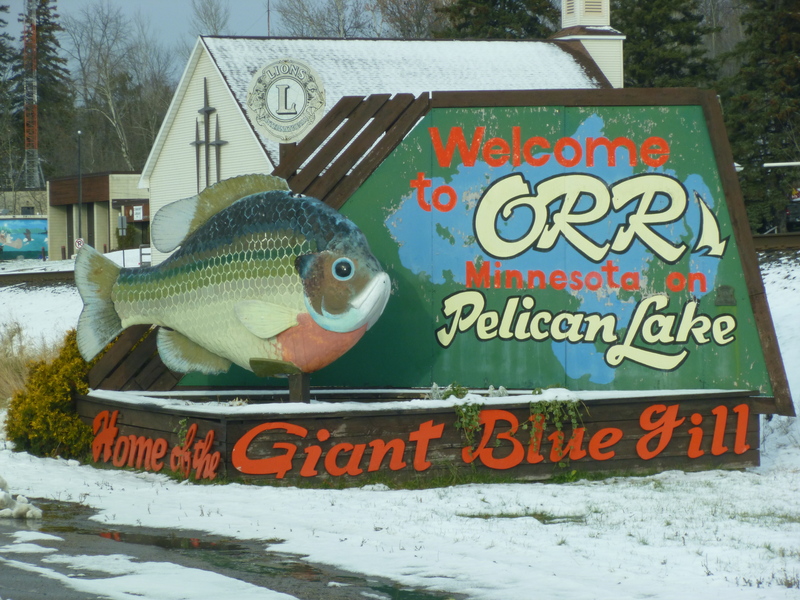 Ely is called the Gateway to the Boundary Waters Canoe Area Wilderness, and the town was fun to walk through – there were lots of places to sign up for canoe trips and fishing trips into the wilderness, and when I look at all the rivers and lakes in the whole area on a map, I don’t know how anyone finds their way back to the exact place they started! 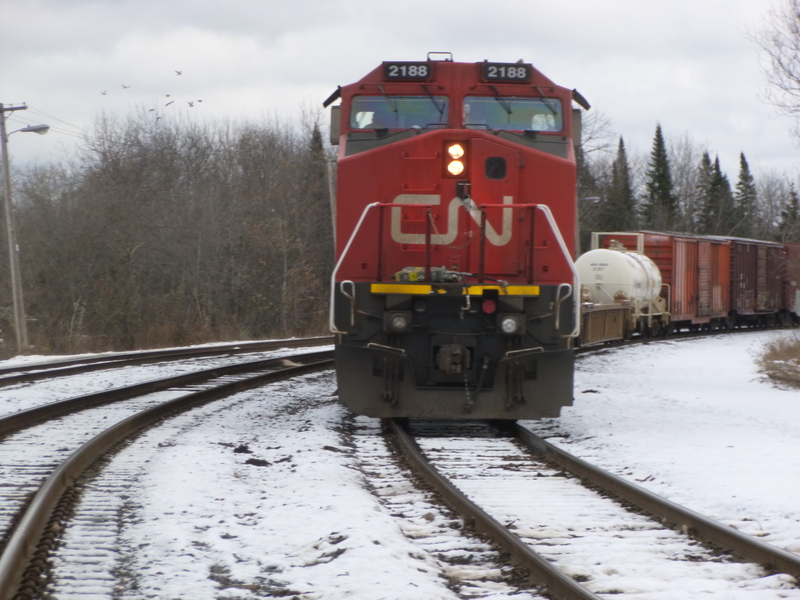 This was fur-trading country 200 years ago, and the rivers and lakes were the means of transportation up into the Canadian Northwest. I walked over 3 miles in town in the falling darkness. I needed to put on some more miles tonight – I had been dawdling and I only had one day left in Minnesota. 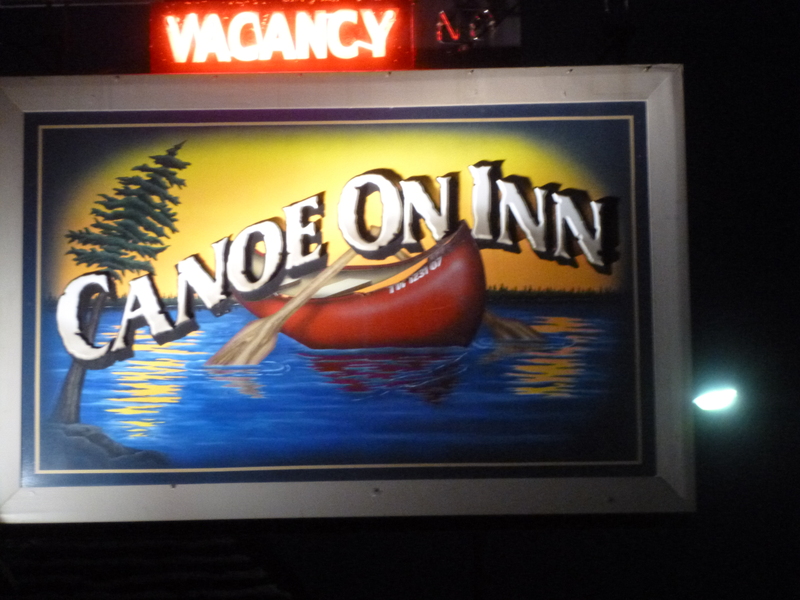 I made a reservation at a little motel in Silver Bay and I thought I was headed in that direction. 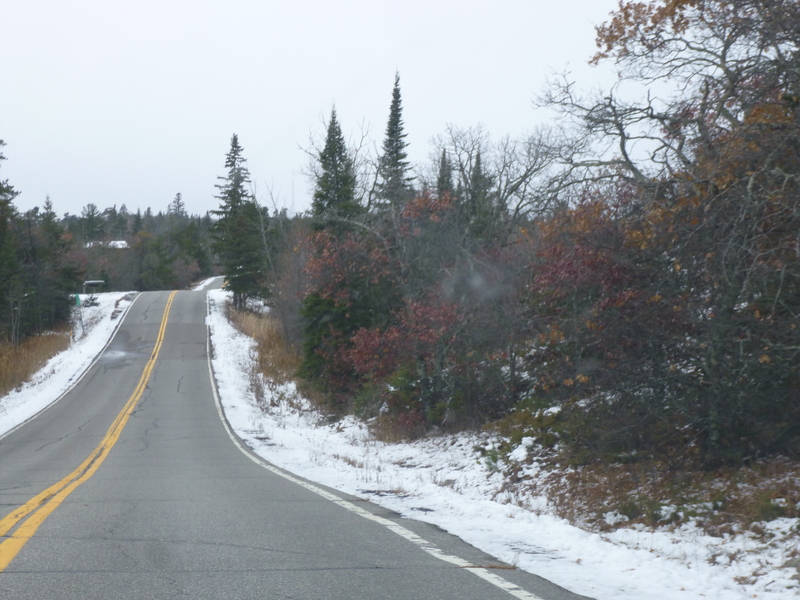 But I had missed a turn, and was so mesmerized by the peace and beauty of the snowy evening in the woods that it didn’t occur to me to wonder why the road was kind of narrow and why there was no other traffic. There was an undisturbed layer of snow on the road that shimmered like crystals in the moonlight and I felt like I was in some kind of magical land, or a snow globe. I’m pretty sure it cast a spell on me and I just kept driving through the forest. I was jolted back into reality when I saw a sign that said the road was ending and something else about territorial waters. It dawned on me I was not on the road I thought I was, and I had to backtrack a bit to figure out where I was. 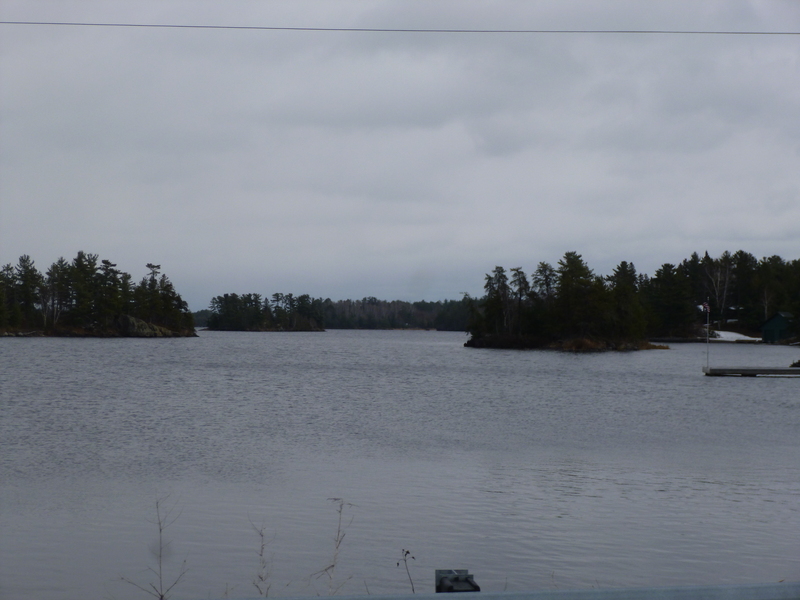 It turned out I had driven as far into the Boundary Waters area as one can drive. The only way to have continued in was in a boat! It had been a slow drive because of the snow and I had to retrace all the miles, but I wouldn’t have wanted to miss out on that little drive! I passed a sign that said I was in a moose area and to drive with care, but I didn’t see any moose. I got myself on the correct road, and when I was in phone range again, I called the motel, which was just a small place, to let them know I’d be late, and they just left the key in the door of my room. Most of the remaining drive was still snowy, so it took a while, and when I got to the motel I saw that the wheel wells of the van were caked full of snow, and the back of it it was covered in ice, and none of the other cars that were parked there had any snow on them. The van looked like it had really been on an adventure! 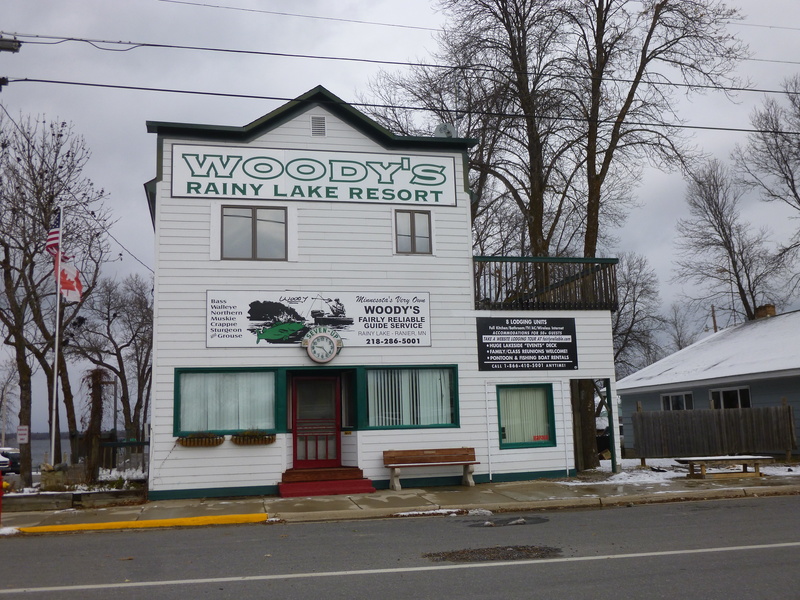 The motel was another cute little mom-and-pop place called Whispering Pines, and the rooms were decorated in a northwoods motif that suited the day. I slept like a rock!